My kids have been playing Minecraft for years. They even have watched countless hours of videos to hone their skills on this very popular video game. 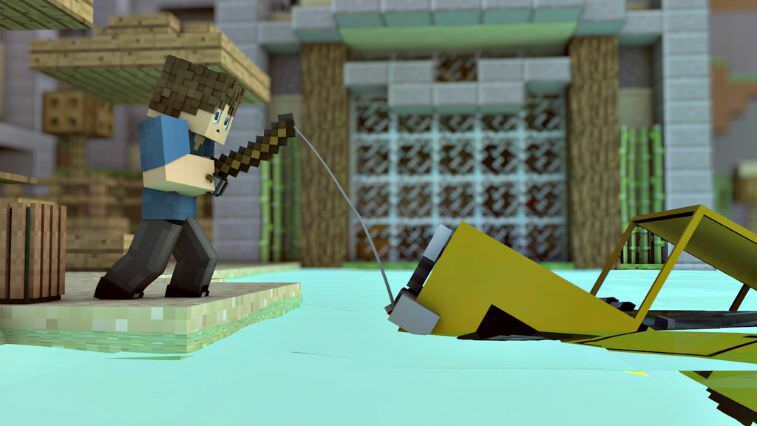 So who better to ask about fishing on Minecraft than them? The following guide is courtesy of my two boys. Catching fish from a boat. Fishing rods can be crafted with 3 sticks and 2 strings. Sticks can be acquired by putting two wooden planks into the crafting grid. String is acquired by killing spiders and cave spiders, and by destroying cobwebs and tripwires. Place the three sticks into the crafting grid in a diagonal pattern (top right, middle, and bottom left). Then place the string in the grid directly under the top right stick. And there you go, you now have just constructed a fishing rod and are ready to go fish. TIP: You can make a fishing rod and keep it in your inventory until you're ready to use it. 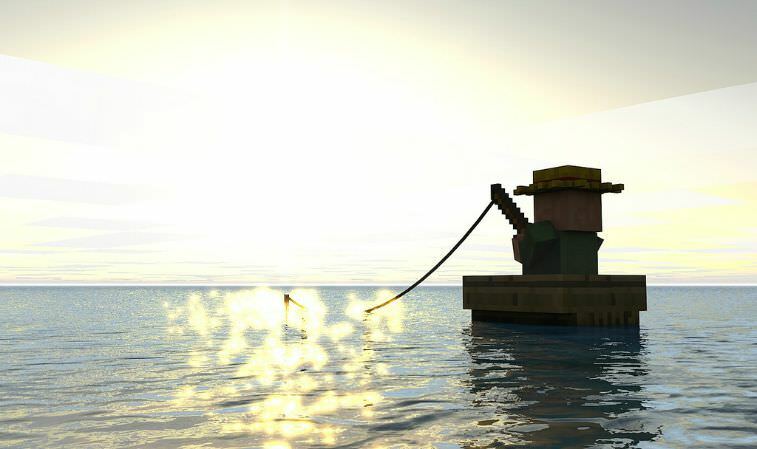 My oldest boy says that Minecraft fishing is kind of hard to do. He told me "it's just like fishing in real life,... often boring unless we are catching a bunch of fish." I just don't think he has the patience for it. The first thing that you need to do is find some water, such as a lake or ocean. Or you can dig a hole and pour a bucket of water into it. Computer: Right click on your mouse. Playstation 3, 4 and Vita: Press L2 on the controller. Xbox 360 and Xbox One: Press LT on the controller. Once you make the cast, your line will go out and you'll see your bobber sitting there on top of the water. Then you wait and wait and wait, until finally a fish comes and gets hooked. When you see bubbles on the water that means a fish is coming for your hook. When the bobber is pulled down that means you caught one. Click the button on your controller and the fish will come jumping out of the water toward you. But, if you wait too long then your bobber will break off. There are a few tips and tricks to catching fish easier and faster. The first thing that you may want to do is make sure that it is raining. Enchanting your fishing rod also increases your chances. You can enchant with Luck of the Sea or Lure. However, Lure increases the chances to drop fish, but Luck of the Sea doesn't. Make sure that your rod is hit by sun or moon light. Look to find a new source block so that you are guaranteed new fish. Don't leave your bobber in for too long or the fish will get away. You can use AFK fishing to have the fishing automatically done for you. Fishing rods can catch up to 65 items before breaking. They can be used to drag around mobs. When you hit a mob with your rod, it wastes three uses. When it hits the ground it wastes two uses. They also can activate pressure plates. Lure: Increases chances of getting fish, and less of a chance for snagging other stuff. Luck of the Seas: Increases the chances of catching treasure items, and less of a chance to catch junk. Treasure items help you out. Junk are items which represent pollution. You can catch cars and other cool junk when you have mods. There are basically four types of fish that you can catch. Salmon: Can be cooked and eaten. Pufferfish: This is a poison fish. Don't eat. It will make you hungrier than before. These can be used to brew with an awkward potion to concoct a Water Breathing potion. Clownfish: Not very useful. But it does heal your hunger. Cod Fish: (Also referred to as "regular fish") Can be eaten raw. Cook in a furnace for more nutrition. All of these fish can be fed to Ocelots to tame them. You can fish anywhere, just as long as it's in a water source block. Congratulations! 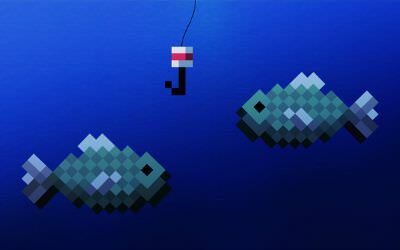 You now should know everything that you need to about fishing in Minecraft.